1 Locum Consultant Dermatologist, Medway Maritime Hospital NHS Trust. Gillingham ME7 5NY, Kent, UK. Barnet, Herts, EN5 3DJ, UK. Persistent Erythema Multiforme is one of three clinical subgroups of erythema multiforme: classical, recurrent and persistent erythema multiforme.The hazards of steroid therapy, both inhaled and oral, in asthmatic patients are well known. The following case report presents an unusual complication of steroid therapy, namely herpes simplex of the oral mucous membrane. This is associated with erythema multiforme in a10 year old male patient on inhaled beclomethasone treatment for two years. Tzanck smear and culture of swab from the lesion grew herpes simplex virus. The patient did not respond to four courses of Acyclovir. However, both the mucous membrane herpes simplex and the eryhthema multiforme healed completely in two weeks after changing the steroid inhaler to Salbutamol inhaler. Oral and inhaled steroids are useful in controlling the asthma. However, the side effects resulting from long- term and high dose corticosteroid are well known. These include dry mouth and throat, hoarseness voice and oropharangeal and laryngeal infection with candida. The present article describes the occurrence of herpes simplex of the buccal mucosa in a steroid - dependent immunocompetent asthmatic child while on inhaled Beclomethasone dipropionate twice daily for two years. In this instance, the herpetic infection did not respond to Aciclovir. A 10- year- old white male presented with a first episode of erythematous, vesicular lesions with target lesions on both palms and erythematous, vesicular erosions on the mucous membrane of lower lip of six months duration (Fig.1a and 1b). The rash started three days after the episode of herpes simplex on the mucous membrane of the mouth. A swab and Tzanck smear were taken from the lesion on the buccal mucosa which confirmed herpes simplex virus infection. He had previously been given four courses of Aciclovir of 400mg TDS for seven days each, without any improvement. It was felt that he had herpes simplex resistant to Aciclovir and treatment with Foscarnet was considered. Fig 1: (a) Erythema Multiforme (b) Herpes simplex lesions in 10 years old asthmatic patient. Past medical history revealed asthma on beclomethasone inhaler twice a day for two years. On the day of examination he was not found with dyspnea. His GP agreed to stop the Beclomethasone and put him on a Salbutamol inhaler. Two weeks after stopping the Beclomethasone, both the erythema multiforme and the herpes simplex lesions had dramatically improved (Fig.2c and 2d). Fig 2: (c,d) The same patient two weeks after stopping the Beclomethasone. Persistent erythema multiforme due to herpes simplex is rare. Three distinct subtypes of erythema multiforme have been identified: classical, recurrent and the persistent erythema multiforme. The latter is characterised by the occurrence of typical and atypical lesions without interruption[1,2]. The major importance of this report, however, is to point out the possibility that the patients' asthma may have precipitated this unusual occurrence. Aerosolized steroids can predispose to viral infection by direct mucosal injury and by deposits in the oropharynx and causing local decrease immunity or by systemic absorption. Retrospective questioning of this patient revealed that he rarely rinsed his mouth after using his inhaler and even less frequently expectorated the rinsed water, factors which would significantly enhance the amount of Beclomethasone deposited in the oropharynx and the systemic absorption. Systemic absorption may inhibit the systemic cellular immune responses. The steroid treatment may partially suppress the erythema multiforme but may encourage the viral growth. The presumption that the herpes simplex virus is a primary one rests with the de novo appearance during convalescence of specific cellular immunity and compatible clinical illness. Sero- conversion, the only definitive laboratory method of diagnosis was not documented. If this episode does indeed represent reactivation of the disease, then iatrogenic immuno-suppression via administration of Beclomethasone, damaging barriers as well as cellular immune response, becomes a much more plausible possibility. Doctors caring for children with asthma should be aware of this unusual complication. 1. Chen CW. Tasi T.F.Chen Y. F, Hung C.M. 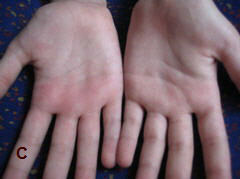 Persistent erythema multiforme treated with thalidomide. Am J Clin Dermatol 2008; 9(2): 123-127. 3. M. P. B. Hemstreet, D. W. Reynolds and J. Meadowes. Esophagitis- a complication of inhaled steroid therapy. Clinical Allergy 1980; 10: 733-738.